A fan’s notes on Winnie the Tory, tanked-up inventor of the tank and stalwart captain of Team UK in its finest hour. There’s only one way to look at a politician, said the curmudgeonly H.L. Mencken: down. But Rubin (Law/Yale), born after Churchill left this vale of tears, finds no cause to scorn the venerable Winston. His contemporaries surely did, of course, and for many reasons: some because his mother was American, some because he was apparently indifferent to the working class, some because he was something of a cold fish. Rubin takes up those arguments one by one, offering a sort of point-counterpoint examination of Churchill’s character. Considering him overall to have been a “tragic hero,” she allows that his critics had their points. On Churchill’s legendary drinking, for example, she accepts with regret the possibility that Churchill may have been an alcoholic—after all, he drank 96 bottles of champagne in two weeks after being turned out of office at the end of WWII—but counters, “Given Churchill’s extraordinary accomplishments . . . it’s difficult to credit that dependence on alcohol in any way impaired his health or abilities.” Explaining merrily away, Rubin favors a newsreel style throughout: “When Prime Minister Neville Chamberlain’s government fell in May 1940, the nation turned to Churchill. At last his unique qualities were brought to bear on a supreme challenge, and with his unshakable optimism, his heroic vision, and above all, his splendid speeches, Churchill roused the spirit of the British people.” Though her research obviously goes deep, a little of this breeziness goes a long way—and doesn’t really do justice to a complex man whose long life began shortly after the Civil War closed and ended the year Malcolm X was assassinated. 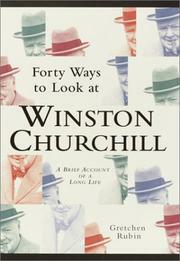 Consider this a Cliff’s Notes for those too busy to read Churchill himself or one of his many solid biographers. Not much meat on these bones.